Your garden is comprised of several components. While the plants are always the highlight of any garden, your landscape is also created from physical structures. Incorporating garden structures in your landscape can give you privacy, allow more space for climbing plants to grow, and add style to your property. This post contains 7 stunning garden structure ideas that will transform your landscape. Climbing plants include beautiful plants such as passion fruit vines, wisteria, and roses. Naturally, you will want to create a trellis for these plants. When you build your trellis, consider that the plant will create a canopy that will be useful, even when the plant is dormant. Thus, you can perhaps use your trellis to cover a walkway. You could also have a trellis that provides shelter and shade for benches. It’s easy to simply build a wall to provide more privacy in the garden. However, if you want to truly transform your landscape, look for garden structures for both privacy and beauty. If you want a privacy screen for your sitting area or a hot tub, you might consider a lattice wall. Climbing roses will then wend their way through the wall and shield you from the neighbors. Concrete pads, walls, and pathways can enhance your landscape with added functionality. For instance, you could install an attractive stamped concrete pad for a picnic table. You could also install a set of steps to provide access to your tiered landscape. You want to enjoy your garden all day long, so think about installing a subtle lighting system that can illuminate your garden path or even special plants. Some plants are especially sensitive to light, so be careful when choosing which plants to light at night. For lighting paths that are open to sunlight, simple solar lights could suffice. If you want the strongest, most reliable lighting, work with an experienced contractor who can connect your lights to consistent power. 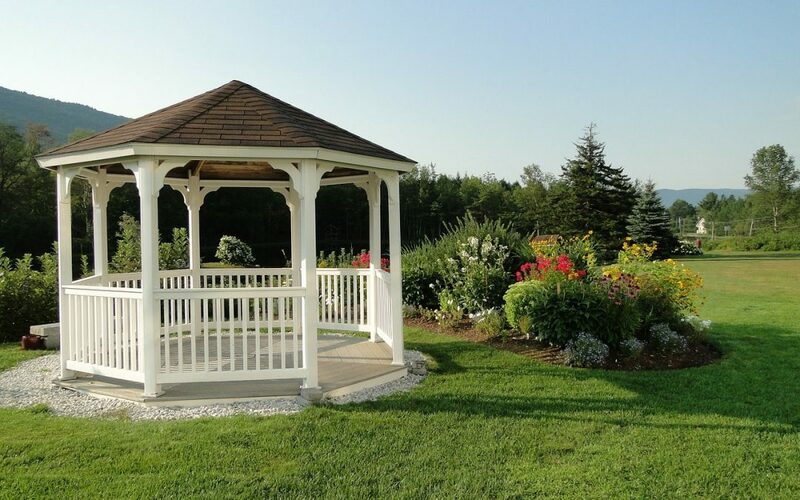 You can add beauty to your landscape space with a stylish gazebo or patio cover. A gazebo not only adds a stunning structure for a dynamic landscape, you can spend time underneath the structure enjoying your garden! A skilled landscape contractor can incorporate a garden structure such as a gazebo or patio cover into your overall landscape design to create a cohesive space you can enjoy to the fullest. When you design your garden, you want it to be aesthetically pleasing, a work of art, if you will. Why not then add sculpture to your garden? Your local area is likely home to many artists and sculptors who create 3D objects that will inspire and impress your guests. Portland area sculptors are bound to have something to your liking. With a little searching, you’re sure to find a sculpture that pleases your eye, and your budget. The sound of falling water is always soothing. When you add a fountain to your garden, you complete a sanctuary that will help you relax and enjoy the beauty of nature. There are many different sorts of fountains to choose from. Some are in the form of a wall of water and others are more typical reflecting pools with a spout of water. Still others reflect a more rustic feel, featuring a metal pipe and a large metal basin. You can find the perfect fountain to fit in your landscape design, as well as match your desired water usage goals. Crowley Landscape Management designs, installs, and maintains gardens for residences and commercial properties. We can construct the landscape of your dreams, complete with beautiful garden structures that will fit your vision.